AMD is today refreshing its line of 28nm 'Kaveri' APUs with the launch of three new additions, the A10-7800 ($155), A8-7600 ($101) and A6-7400K ($77). Cast your memory back to January of this year and you'll recall that the Kaveri architecture combined Steamroller CPU cores with up-to-date GCN graphics on a 28nm process and in a widely-available FM2+ form factor. That's the crux of it, though a deeper overview of the architectural enhancements is available in our earlier analysis for those in need of a thorough recap. At launch, the range-topping A10-7850K highlighted the fact that while AMD continued to play second-fiddle to Intel in terms of raw CPU core performance, the firm's superior Radeon graphics made the new APU a decent all-round chip with regards to mainstream applications, general-purpose compute and gaming. 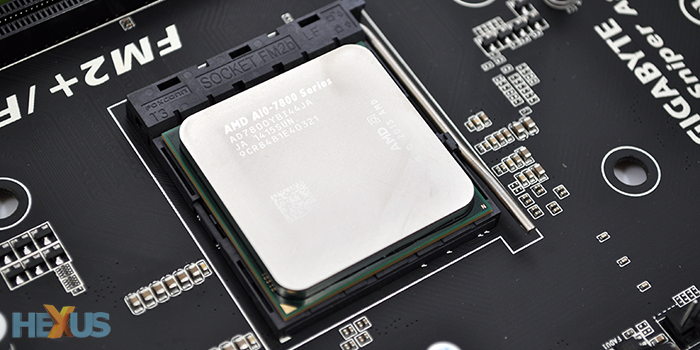 Trouble is, not being able to go toe-to-toe with Intel in the all-out performance stakes means that the APU is best positioned as a low-cost part primed for mainstream and small-form-factor machines. And in order to strive in that scenario, AMD needed to come to market with energy-efficient, sub-65W parts. 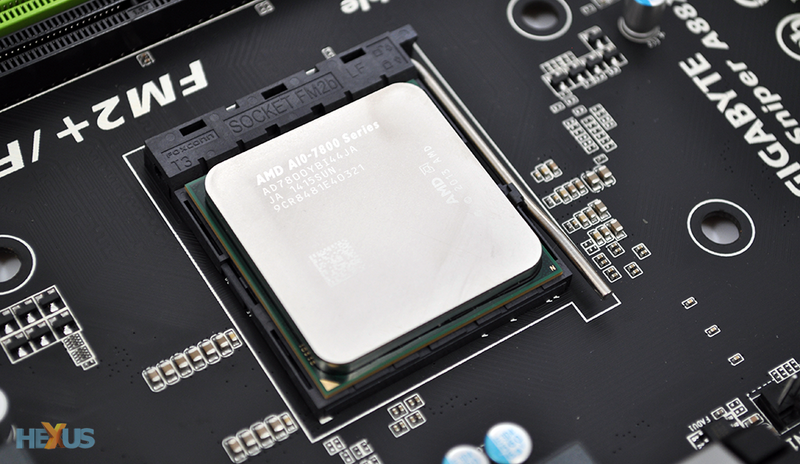 That didn't happen, as initial availability was limited to one of two 95W options, the A10-7850K or A10-7700K. On paper, it was the third-rung, 45W A8-7600 that appeared most promising, but ongoing delays have resulted in said chip heading to retail some six months after initial reviews. That's a heck of a long wait, but it's a case of better late than never, and if you've been patiently awaiting an energy-efficient Kaveri APU, there are now not one but three to choose from. The key specifications for the three 'new' additions are highlighted in the table above. We're not convinced the A8-7600 can strictly be classed as new, but we're willing to go with it as AMD assures us there will be no retail snafu this time around. We're informed, unequivocally, that "all parts (7600 included) are available in distribution." Bringing much-needed efficiency to the Kaveri range, the latest trio offer a configurable TDP that allows the user to choose between 45W and 65W operating modes. This is in stark contrast to the initial 95W parts, and makes either of the new chips better suited to compact machines such as HTPCs. Choosing the desired TDP is as easy as selecting an option from within the motherboard BIOS, and AMD has been tweaking the technology to help squeeze every last drop of performance when running in the most energy-efficient 45W mode. AMD refers to this as the optimised TDP and it's worth noting that peak frequency remains the same whether or not the chip is running at 45W or 65W. The difference is how long the chip can maintain the specified clock in the respective power envelope, meaning the average clock speed will be somewhat lower at the reduced TDP. A couple of points of interest. Firstly, the long-overdue A8-7600 is arriving at a lower suggested system builder price - $101 as opposed to the original $119 - which should appease anyone who has been left waiting all this time. Secondly, a new dual-core, multiplier-unlocked K-series option is available in the form of the A6-7400K, and while it also has a cut-back Radeon R5 GPU, it lowers the Kaveri entry point to $77, putting it firmly in Intel Pentium territory. Last but not least, there's the A10-7800, which is on the test bench today. Armed with Kaveri's full compliment of compute cores - four CPU and eight GPU (each with 64 shaders) - it offers almost the complete specification of the range-topping 7850K, which is impressive considering that TDP has been cut from 95W to 65W/45W. We lose a little in terms of peak frequency - base clock drops by 0.2GHz while turbo clock slips by a mere 0.1GHz - and of course average speed will drop further when running in the optimised 45W mode. A10-7800 should fetch around £115 at UK retail, we reckon, and with FM2+ motherboards starting from as little as £30, we could have the makings of a tidy, low-power platform. Let's move on to the benchmarks.